The European Commission indexes of economic activity for June continued to erode at the pace of oxidation. In three months the headline index has lost only 0.5 points, but it has declined in each month. Only two of the five sector gauges dropped in June: consumer confidence and construction. The industrial gauge, retail gauge and services gauge each were unchanged month-to-month. The Markit three-sector gauges of activity have lost relatively more ground over this period. As for the standings, the overall EU Commission index for the EMU has a standing just outside of its 90th percentile. Three gauges have standings at or above their respective 95th percentiles: construction, industrial, and consumer confidence. The retail sector has a reading that is just in its lower 91st percentile, still an impressively strong reading. 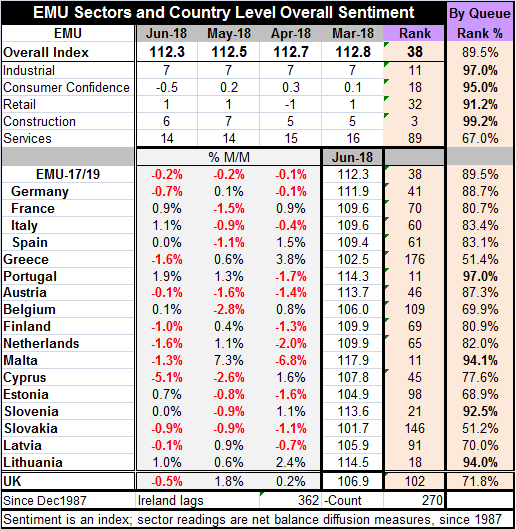 The overall EU metric is dragged down by the services sector whose reading stands only in its 67thpercentile, barely inside the top one-third of its historic queue of data. Among the 19 EMU members, Luxembourg and Ireland are not timely reporters. Of the 17 countries that report data for June, nine of them, slightly more than half, show index declines in the month compared to May. Among the four largest EMU economics, Germany logs a decline of 0.7%, France posts a gain of 0.9%, Italy logs a gain of 1.1%, and Spain’s index is unchanged. Among member countries only four, Portugal, Malta, Lithuania and Slovenia, have indexes with queue standings in the top 10th percentile of their respective historic queues of values. However, an additional eight countries have ranking in their 80th percentiles. The relative weakest readings are from Slovakia and Greece both of which have standings in their respective 51st percentiles, just above their historic medians. The average percentile standing for these 17 countries is the 80th percentile; the median is at the 82.6 percentile mark. Both of these are strong readings. The obvious conclusion is that Europe has transited into some sort of weak spot and the weakness is in some sense broad-based since more than half of the respondents for June also saw declines in their country indexes for April and May as well. But the slippage on a weighted basis, which is what the headline tracks, has been quite minor. The unweighted country rating of the country leaves index is at the 80th percentile for the EMU as a whole, but the weighted standing is much higher at the 89.5 percentile. There is an issue with momentum here but not much of one. And there is further risk as a number of destabilizing events are in train from an inability of the EU to agree on a comprehensive migrant policy to an incipient trade war with the United States. There is, in addition, the as yet unknown status and posture of the new Italian government that came into office on rather harsh-sometimes anti EU/EMU- rhetoric, but as yet has not followed up on that. The trade war is a real threat. Europe has countered the U.S. steel and aluminum tariffs undertaken for national security reasons with a broader array of tariffs on U.S. products aimed to hurt the President’s constituency. There is the clear potential for this to get out of hand. The trade war, Brexit progress and the upcoming path of ECB policy remain among the most important events to keep an eye on that could affect the European economy. But even that list is not exhaustive. We live in times of conflict and not much compromise.